Industry 4.0 has a lot of potential and it’s an exciting time to be involved in industrial automation. New solutions are taking shape and stand to make automation networks easier to manage, faster to run, and most importantly, provide value like never before. Concepts like TSN, OPC UA, and APL are making headlines and the race is on to leverage each in order to gain a sustainable competitive advantage. There's no silver bullet, but PROFINET plays a key role. PI is proud to publicize its market-leading, independently-audited node counts. We know where we're going with Industry 4.0, because we know where we've been. The de-facto serial fieldbus standard, PROFIBUS has sold more nodes than all other fieldbuses combined. PROFINET leads the Industrial Ethernet market in terms of adoption breadth and depth, and is foundational to Industry 4.0. IO-Link is experiencing exponential growth as companies attempt to collect data from ever-smarter sensors. A future-proof industrial network is one that provides performance for today and flexibility for tomorrow. PROFINET is the only Industrial Ethernet standard built to handle the requirements of the shop floor while supporting multiple protocols for the top floor. Ethernet is going real time! Ethernet communication is based on the best effort principle. Delays and throughput are situation dependent (empty network vs crowded network). With Ethernet, each device operates independently and on its own local clock making sending data in a precise time frame difficult. TSN (Time Sensitive Networking) refers to a set of IEEE 802 standards that make Ethernet deterministic by default. TSN is a technology that sits on Layer 2 of the ISO/OSI Model. TSN adds definitions to guarantee delays and throughput. TSN integration into the Ethernet basic standard promises long time availability. TSN evolved from the industry's use of Audio / Video delivery and the need for more devices and synchronized communications. As more users connect up their devices to the Industrial Internet of Things and Industry 4.0 this also boosts demand. There are more devices on networks than ever before and more information being shared and analyzed. Therefore it makes sense that Ethernet has to perform better. TSN integration into Ethernet is done based on the latest architectural model for bridges. Bridges can also be referred to as Ethernet switches. These bridges are capable of transmitting TSN Ethernet frames according to a schedule. First, the path is defined for a specific packet, then the traffic is prioritized in each bridge. A bridge may be envisioned as a roundabout with one entry per road (port) and many exits per road (port). The exits are prioritized against each other and only defined packets are allowed to use the high priority port. TSN packets overtake on the exit, ensuring they have a given latency in each bridge. Continuity: The proven PROFINET user view of data, configuration, diagnostics and Application Profiles such as PROFIsafe or PROFIdrive can be used unchanged. Standard Ethernet Technology: PROFINET relies on standard unmodified Ethernet. Therefore, even with TSN, it can both have a broad selection of COTs chip supply and also benefit from the further developments of IEEE technology such as gigabit bandwidths. High Determinism: Synchronous networks can be implemented for isochronous applications with TSN. Extremely Robust: TSN will bring robustness to IP-based traffic, which by default is not real-time capable. The reliability will increase since TSN allows bandwidth to be reserved on the network for individual tasks. Then, those tasks won't be disrupted by other best-effort traffic. One indicator of the market relevance of new technologies is the early availability of various solutions from different manufacturers. Assigned working groups from PROFIBUS & PROFINET International (PI) are actively working on an open solution for integrating TSN into PROFINET. A live demo with solutions from three different manufacturers, which was introduced to the public for the first time at SPS/IPC/Drives 2018, shows how easily TSN can be integrated in view of different technologies. There are a number of benefits to the various solution providers' specific implementations of TSN in hardware and firmware, which is occurring at the same time as the development of corresponding specifications. For instance, it is possible to assess how the specifications can be realized in real products and to verify whether the specification is consistent, complete, and interoperable. The interoperability between different technology providers gives device manufacturers the possibility to choose a platform that is best suited to their specific device, as they were accustomed to doing in the previous PI ecosystem of solution providers. As with all new technologies, the application and its associated requirements are always of primary importance for PI. Only when these basics have been established, can concrete implementations be tackled. This is the case with TSN. Using a demo application, PI shows how TSN can be integrated into PROFINET, thus pointing the way to further specification and standardization work. With TSN in particular, the underlying IEEE standards permit a great deal of freedom in use. This is why it was important to precisely define the industrial conditions. For PROFINET, this means that the user perspective (i.e. the way users experience the technology), in particular, should not differ from the way things are today. It’s also necessary for TSN to provide improvements like “plug & work” functionality. This was shown for the first time at the Hanover Trade Show in April 2018 in Germany. The live demo consisted of a TSN network with a topology which changes at runtime without the need for manual reconfiguration – a significant advantage in comparison to today’s world of IRT or a static TSN configuration. The way existing PROFINET networks and devices can be integrated is also being demonstrated. This is indispensable for an easy and smooth transition to TSN. TSN is a catchall name for a series of new standards whose goal is to improve determinism in “standard” Ethernet networks. It grew out of the needs of Audio/Visual delivery. But industry has the same needs for speed and determinism. So industrial consortia and industrial companies jumped into the standardization effort. The effort is ongoing. Some of the standards are complete and some are in draft. But the efforts are far enough along for demonstrations and preliminary products. There are many articles in the trade press touting TSN. Here’s what users of PROFINET have to do to prepare: Nothing! PROFINET uses standard unmodified Ethernet, typically, with wired 100Mbit/s infrastructure, but it’s just Ethernet. So gigabit Ethernet is fine for PROFINET. Multi-gigabit Ethernet is fine for PROFINET. Wireless is fine for PROFINET. Fiber instead of copper is fine for PROFINET. TSN is fine for PROFINET. The good thing about PROFINET building on a broadly adopted commercial standard like Ethernet is that PROFINET rides its evolution to higher speeds and other features, like TSN. But what if you need the synchronization and speed of TSN and you need it today? There is no need to wait; PROFINET already provides IRT for just those needs. TSN may provide comparable performance someday. And there are some other unknowns with TSN. Configuration is required. How will that be done? Whatever is needed to configure and implement TSN, PI is working now to make that easy for the user. If you think that TSN replaces PROFINET you’re forgetting that TSN is just part of Ethernet and Ethernet is not an end-to-end protocol. An application layer protocol like PROFINET is needed to complete the delivery of the data. No matter how the Ethernet standard evolves (TSN included), you still need an application layer program to make a whole solution. In conclusion, there is nothing you have to do about TSN. When the time comes, PROFINET will use it just like it uses standard Ethernet today. And if you need synchronization, speed, and determinism today -PROFINET IRT does that now. TSN (Time-sensitive Networking) is a promising new IEEE technology for Ethernet that combines the bandwidth of IT (Information Technology) networks with the latency of OT (Operational Technology) networks. TSN consists of a tool kit of standardized mechanisms that can be used in Ethernet-based networks. In PI's Industry 4.0 Working Group, the requirements and goals for the future use of TSN with PROFINET have now been worked out. The focus of the work is first and foremost on easy handling for PROFINET users. They should be able to use the new technology easily in their devices or systems while still taking advantage of existing knowledge. Furthermore, services such as diagnostics, parameterization, etc. should be identical to the current landscape. The engineering, that is, the configuration of the network, should also be performed in a familiar way. In this way, PI provides an easy transition to the new Ethernet landscape and ensures broad acceptance among users. Since PI relies on standard Ethernet technology it can both draw on a broad selection of Ethernet chips for the implementation of the PROFINET interface on devices and also benefit from the further developments of IEEE technology such as gigabit bandwidths. Besides a stack architecture that is easy to integrate and scale, a further crucial goal for the use of the technology is a high degree of determinism and robustness for IP-based traffic that is not real-time capable. The reliability increases, since TSN allows bandwidth to be reserved on the network for individual tasks so they are not disrupted by other traffic. This is especially important, since a variety of protocols will be used side by side in the future in Industry 4.0 networks. For example, PI incorporates parallel communication with OPC UA between stations at the system level or from devices on the field level to the cloud. However, with the introduction of TSN, it is also necessary to simplify the engineering of the network for more complex systems, until they become plug-and-work-capable networks that permit reconfiguration during ongoing operation. PROFINET is optimally complemented by OPC UA. The two standards work together to smooth the path to seamless communication in the world of automation and IT. With Industry 4.0, there is the need to publish data to IT systems like MES, or Asset / Condition Management applications. Today this requires a lot of configuration effort and manual steps to make this data available. Since there is no standardized data semantics specified, often the data is not usable in an economically meaningful way. For this reason, PI supports OPC UA as a complementing service in PROFINET networks. OPC UA is an object and service-oriented architecture which features not only a standardized structure for the transport of data but a machine-readable description for data packets. The strengths of OPC UA lie in vertical integration and M2M communication. The concept of machine-to-machine (horizontal) integration is nothing new for PROFINET. In fact, the very first version of the protocol was used in this fashion before being expanded to I/O data exchange. Instead of reinventing the wheel, the Industry 4.0 Working Group made the decision to adopt OPC UA as the best way to integrate PROFINET from Controller to Controller. In combination with TSN, OPC UA allows machines from various vendors to communicate deterministically. PI developed PROFIsafe in the 1990s. Today, PROFIsafe is a mature technology and the world market leader among safety-oriented protocols. However, until now, fail-safe communication via a fieldbus or Industrial Ethernet has been limited to master-slave or controller-device architectures. There is no cross-manufacturer standard for M2M failsafe communications. Currently, appropriate couplers are used for reliable transfer between machines and between the controllers used in machines. After considering several use cases, PI decided to expand PROFIsafe to the machine level. Since PI has adopted OPC UA for M2M communication, it makes sense to expand PROFIsafe to OPC UA. A specification is now being developed for safety over OPC UA based on PROFIsafe. Finally, end-users and developers will be able to implement a cross-manufacturer standard for M2M safety with a familiar and proven safety technology. OPC UA has become the de-facto standard for interoperable information exchange from the shop floor to the top floor (vertical communication). 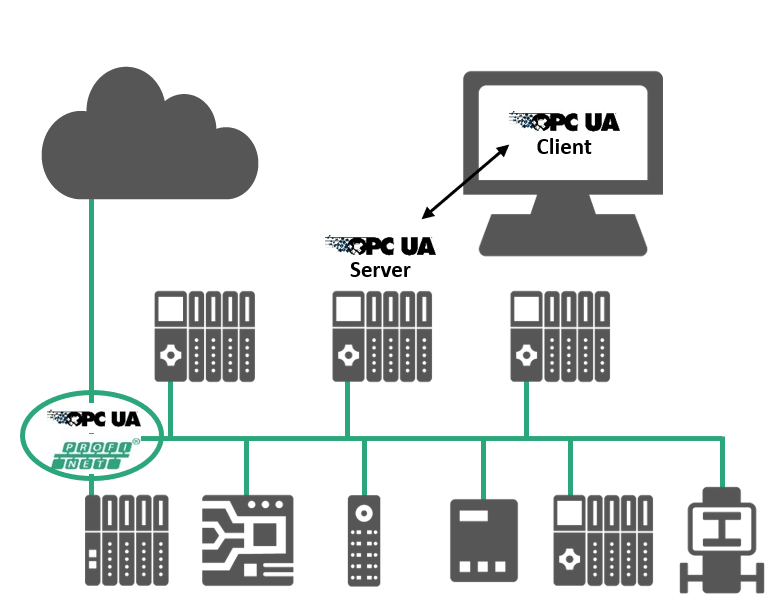 With its robust object-oriented information model and platform independence, OPC UA is proving to be the most efficient way to move semantic information around a plant. This fits perfectly with PROFINET with its ability to run different protocols independently on the same Ethernet network. OPC UA is a perfect aid to boost vertical integration in PROFINET systems and to bring added value to end-customers. Asset and diagnostic data from the devices employed today can be collected in a system controller through existing mandatory PROFINET services and delivered to higher-level entities by means of OPC UA. This service can also be offered by an edge gateway, which can additionally be added to the system. With this approach, no changes have to be carried out on the controller. It is also possible to directly integrate the OPC mapping in a PROFINET field device. Currently, PI and the OPC Foundation have a joint working group to create an OPC UA companion specification for PROFINET. The companion specification will include the collection and display of asset management and diagnostic data. Then, the information can be displayed flexibly in specific ways on various devices, based on requirements and possibilities. Within just a short period of time, the joint working group between PI and the OPC Foundation has managed to draft a review version of the specification “Safety over OPC UA Based on PROFIsafe” for controller-to-controller communication. The crucial steps in the fundamental design and detailed specification development have thus been accomplished. The project began at SPS/IPC/Drives 2017 with a memorandum of understanding based on the joint understanding between PI and the OPC Foundation. The respective strengths of these two entities – both in terms of technology and market penetration – needed to be brought together in order to ensure fully reliable controller-to-controller communication. After establishing a joint working group consisting of reputable companies and organizations, the experts for functional safety quickly recognized the key parameters and boundary conditions. The proven protocol security mechanisms (e.g. CRC, codenames, monitoring numbers, watchdog monitoring, and the SIL monitor) can be adopted. However, adjustments are necessary for the state machines, the protocol datagrams, and the initialization, since controllers with equal rights now communicate with each other, rather than a controller communicating with subordinate field devices. Additionally, against the background of Industry 4.0, the support of flexible system structures with changing communication partners are of crucial significance for the acceptance of the standard. This has now been resolved. Safety over OPC UA will support any network topology (line, star, ring, etc. ), while – in principle – connections can also be set up or dismantled at runtime. A given interface can be used alternatingly by different partners. Thus devices such as modular machines, automated guided vehicles (AGVs), autonomous mobile robots (AMRs) and tool changers, etc. will benefit. In contrast to today’s functional safety communication protocols, participants no longer have to know all of the others at the configuration stage. This makes it possible, for example, to add a new mobile robot to a facility without having to reconfigure all of the existing machines. The corresponding draft of the specification has been prepared, and committees can begin the review. An initial trial implementation was featured as a proof of concept at the PI joint stand at SPS/IPC/Drives 2018. This once again shows that the combination of proven, leading technologies and collaboration between strong organizations results in workable solutions. When the Industrie 4.0 Working Group (I4.0 WG) started at PI, five focus topics were determined to be dealt with in separate sub working groups. One of these topics is OPC UA and the goal was to specify the mapping of PROFINET to OPC UA. The mapping of PROFINET will be defined in an OPC UA Companion Specification. For this, a joint Working Group between PI and the OPC Foundation was convened in 2017. To have a comprehensive solution, the Working Group started with a detailed analysis based on use-cases. The first targets are Diagnostics and Asset Management, to create added value for vertical integration. Further evaluation showed that today, OPC UA modeling technologies typically based on device integration (DI) are not capable of covering all aspects of the required use-cases and therefore limit the potential data mapping. To overcome these restrictions, the PROFINET@OPC UA Working Group developed a new modeling technique called “Facet Modeling”. The next milestone will be the release of the first version of the PROFINET@OPC UA Companion Specification scheduled for Hanover Fair 2019. On the basis of existing use cases, the IO-Link Community developed a method for implementing an integration of IO-Link into OPC UA in 2017. “Plattform Industrie 4.0”, an initiative funded by the German Federal Ministry, sees OPC UA as a suitable architectural model for integrating sensors/actuators with IT systems and above (“cloud”). For IO-Link, the point-to-point protocol for sensors/actuators, now with more than 7,000 available different masters and devices, a fieldbus-independent integration via OPC UA is very interesting, as it can be used to further expand the breadth of possible automation solutions. IO-Link masters, which bundle the data from sensors and actuators, can process these data not only as fieldbus nodes, but can also make higher levels available inside and outside of the automation pyramid via OPC UA. PI had already developed PROFIsafe in the 1990s, making fail-safe communication and transfer of process data possible over the same connection. While many users still regarded the new technology skeptically at the time, it has since gained ground over a wide front. Today, PROFIsafe is the world market leader among safety-oriented protocols. PI paved the way to implement completely new possibilities for simplification of machines and systems for users. The technology is stable and mature. However, until now, fail-safe communication via a fieldbus or Industrial Ethernet has been limited to pure master-slave or controller-device architectures. Appropriate couplers are used for reliable transfer between machines and between the controllers used in the machine. But even today, there is no cross-manufacturer standard. Since PI decided upon OPC UA for connections between controllers in PROFINET networks, it is consistent and necessary to also extend the PROFIsafe mechanisms to OPC UA. By reusing the proven, familiar PROFIsafe mechanisms, PI expects significant simplification for manufacturers who wish to implement PROFIsafe on OPC UA in their PROFINET controllers. This assures high acceptance by both manufacturers and customers, as well as bodies such as certification authorities. Furthermore, the users benefit from open technology and thus cross-manufacturer communication at the control level for both standard and safety-related data. To this end, a memorandum of understanding between the OPC Foundation and PI was signed in the run-up to SPS/IPCDrives 2017. The agreed goal is to establish a joint working group of members from both organizations in order to create the PROFIsafe over OPC UA specification for use in a fail-safe controller-to-controller communication. This specification will then become an integral component of the OPC UA specification framework. The OPC UA client-server, Pub/Sub and future Pub/Sub services will be mapped with TSN for various communication requirements. It is apparent today that the service-oriented architecture of OPC UA will be a building block for the development of Industry 4.0. This will be true particularly for communication with devices such as operator stations via the controller level or for production data from devices to corporate IT, especially in an environment with different providers. OPC UA becomes the link for the non-deterministic communication between different types of devices on this level and between levels. PROFINET takes over the transmission or deterministic real-time data and control-relevant acyclic data in automation systems. PROFINET and OPC UA are therefore already a perfect complement to one another today because PROFINET allows open communication based on TCP/IP in parallel without additional expense. For example, automation of a screwdriver control in real-time using PROFINET. Quality data such as tightening torques can then be transmitted to the quality management systems over the same cable via OPC UA. PI Chairman Karsten Schneider is looking forward to the cooperation with OPC Foundation: "In PI we see OPC UA as a complementary technology for PROFINET, the leading Industrial Ethernet standard in automation. The ability to run both services in one network will open entirely new possibilities and will be the foundation for megatrends like IIoT and Industrie 4.0." "The collaboration between PI and the OPC Foundation provides the solution for information integration and interoperability from the embedded world to the enterprise. Suppliers and end-users alike will benefit from this collaboration, and is part of the continuum of the partnership between the organizations reflected in other initiatives inclusive of FDI.” Thomas Burke, OPC Foundation. In order to turn concepts like Industry 4.0 and the Industrial Internet of Things into a reality, PI is investing in new technologies to enable these trends. One of these new technologies is the Advanced Physical Layer (APL). The goal of APL is to bring Ethernet down to field level instruments in hazardous areas. Nowadays, existing field devices typically rely on limited fieldbus network infrastructures. Taking process industries into the future requires a new network standard to transfer process data with standard Ethernet and IP technologies. Ethernet at the field level will make digitalization for process industries a reality. Ethernet adds its universality and speed to existing field device installations. APL will limit current and voltage in a physical layer to have an intrinsically safe solution for Zones 0 & 1 / Div 1. The physical connection will be a rugged two-wire connection with power over this cable. Finally, APL will exceed the 100m limit of 100BASE-TX Ethernet networks to be suitable for large process manufacturing facilities. Division 1 - Ignitable concentrations of hazards exist under normal operating conditions and/or where a hazard is caused by frequent maintenance, repair work, or equipment failure. Division 2 - Ignitable concentrations of hazards are handled, processed or used, but which are normally in closed containers or systems. They can only escape through accidental rupture or breakdown of such containers or systems. Aside from cables and connectors, an APL infrastructure consists of two basic components: APL power switches and field switches. The APL power switches establish the connection between standard Ethernet networks and field devices. APL field switches are installed and operated in hazardous areas. They distribute both communication signals and power via spurs to the field devices. A topic to familiarize yourself over the coming years is APL. If the advancements for Ethernet known as TSN will be felt most in discrete manufacturing, then the advancements to Ethernet known as APL will be felt most in continuous process control applications. But where TSN mechanisms operate at Layer 2 of the ISO/OSI Model, APL operates at Layer 1. The goal here is to bring Ethernet down to field level instruments in hazardous areas. Another three years have passed by since the last Achema already! At this year’s Achema, numerous innovations could be seen and all participants engaged in a lively exchange with scores of customers and interested parties. PI aroused the interest of many visitors with a large multi-vendor 2-wire Ethernet (APL) demonstrator. Achema is the world’s largest process industry trade fair for chemical technology, process technology, and biotechnology. The major trade fair takes place every three years in Frankfurt am Main, Germany. This year the key topics were biotech for chemistry, chemical and pharma logistics, and flexible production. Over 3,700 exhibitors from 55 countries were represented at the trade fair and more than 145,000 visitors learned about trends and products of the chemical, pharmaceutical, and food industries. The impression which Achema gives to its visitors shows the enormous diversity of products and manufacturers along the value-chain in the process industries. Every level known from the automation pyramid can be seen, explained, and demonstrated at the Frankfurt Fair; starting with CAD software for system design and continuing with pipe fitting and metal construction, materials engineering, sensors & actuators, automation engineering, laboratory equipment, as well as finished plant units (skids) and even complete turnkey plants, and finally culminating in the end products of chemical technology, process technology, and biotechnology. Many manufacturers also introduced cloud-based products and services. Alongside this were a wide variety of lecture and discussion forums as well as numerous university booths, which provided insights into current research and important future topics. Within this impressive supply chain, PI positioned itself in Hall 11 where visitors came to learn about process instrumentation, controls, and asset management technologies. Together with other user organizations committed to digital communication technology, a variety of automation companies demonstrated the benefits of digitalization down to the field device level. There were stimulating discussions and live demonstrations of PROFINET, IIoT, and FDI. The biggest magnet for visitors was the new multi-vendor demonstrator of intrinsically safe 2-wire Ethernet, which is also explained in the White Paper published by the APL consortium. Together with end-users, interest groups and manufacturers, I am pleased to take part in this exciting undertaking. I am confident that by the next Achema (June 14-18, 2021), the first certified intrinsically safe 2-wire PROFINET devices and components will be marketable! NAMUR, the User Association of Automation Technology in Process Industries, has outlined requirements for the application of Ethernet in the field in its position paper “An Ethernet communication system for the process industry.” These requirements impact the physical layer, among other things. As a solution for this issue, known as APL – is being created for Ethernet-based communication in the field of process systems, as part of a joint project by well-known industrial companies and organizations, in which PI is taking a leading role. This project is based on the new Ethernet standard whose specifications are currently under development by the IEEE 802.3cg working group, for 10Mbit/s via a two-wire system and for up to 1,000 m including optional power supply. The project’s aim is to define the necessary guidelines for the use of the new standard in hazardous areas, and to determine the requirements and tools for conformity tests and EMC tests. The solution is also set to be tested within the context of reference designs and pilot implementations. As part of the further advancement of Industry 4.0 and IIoT, Ethernet (and thus PROFINET) will establish itself in process automation. PROFINET is fast, powerful, flexible, open and offers a host of functions for the specific tasks of the process industry. This includes optimum redundancy mechanisms, “Configuration in Run” for smooth device swapping during operation, and Time Stamping for the recording of event sequences, etc. With the market introduction of FDI as an integration technology and the deployment of the PA Profile 4.0, PROFINET has taken two more major steps toward process automation. The only thing still missing is a solution with which PROFINET devices can also be provided for use in hazardous areas and with two-wire technology including power supply over the same data line (similar to PROFIBUS PA). And this is exactly the technological orientation of the APL project. Eleven prestigious suppliers of systems and devices for process automation – namely, ABB, Endress+Hauser, Krohne, Pepperl+Fuchs, Phoenix Contact, Rockwell Automation, Samson, Siemens, Stahl, VEGA and Yokogawa – are cooperating with PI in this project, as are the organizations FieldComm Group and ODVA.